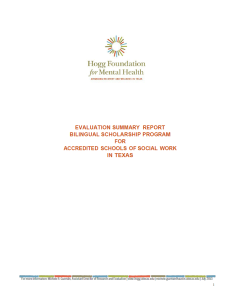 The Hogg Foundation introduced the Bilingual Scholarships for Mental Health Workforce Diversity in 2008 to increase cultural and linguistic diversity in the Texas mental health workforce. The statewide program was the first of its kind in Texas. The foundation committed up to $1 million over three years to fund full-tuition scholarships for Spanish-speaking graduate social work students at 12 Texas universities accredited by the Council on Social Work Education. So far, 109 students have received the scholarships. Download the evaluation summary report here.